I would much prefer to walk somewhere than to drive. It's one of the many reasons I like living where I do because I can easily walk to the post office or the grocery store. I also go for a lot of walks just to go for a walk. And I try to walk every day with the kids I babysit, or we all start to go a little stir crazy, and they seem to enjoy the walks as much as I do. This enjoyment of walking is definitely a family trait, and we often plan our vacations around being able to hike and geocache wherever we're going. Aiden and Zachary think nothing of walking home from school (about 30 minutes) or even walking to a friend's house (45 minutes) and they're more likely to walk to youth group at church than to ask for a drive. As for Nathan, he hardly drove with us to church all summer and fall, preferring to walk there and home each week. We walk so much that when we first moved to town, there were people who thought we didn't own a vehicle because they only ever saw us walking! It's possible the boys would have loved walking even if we didn't walk so often as a family. It's probably more likely, though, that they would have expected to drive everywhere. Kids learn from their parents, after all, so if we thought walking was too much bother then that would have probably been their attitude too. The phrase 'Do as I say, not as I do' isn't an effective way of training children. Chuck Swindoll, of Insight for Living, uses the phrase "Better caught than taught" when referring to character traits that children are better able to pick up by seeing their parents model them than by simply being told. Telling the boys that walking is good for them wouldn't have been met with much enthusiasm if I hopped in the car every time I needed to check the mail. I thought about this, and about our walking habit, when I read 1 Peter 1:15,16, which says, "But just as he who called you is holy, so be holy in all you do; for it is written: 'Be holy, because I am holy.'" If you're anything like me, the command to be holy seems like an impossibly tall order. We know we're not perfect! God certainly knows we're not perfect. And yet, here He is, commanding us to be holy. First off, God knows we're not perfect, but this command to 'be holy' is the goal for us to reach for. If my aim is to be holy in everything I do, maybe that will cause me to keep my mouth closed when tempted to share a bit of gossip. If my aim is to be holy, then maybe that means I will try even harder to be kind and patient when confronted with difficult people. And if my aim is to be holy, maybe that means I will not be so judgmental. We'll never get it perfectly right, but it's certainly better to be aiming for holy than for nothing at all. Second, holiness is something we need to 'catch' from our Father, like the boys catching a love of walking from us. God is holy, so the more we spend time with Him (through Bible reading and prayer), the more likely that holiness will start to appear in our lives too. 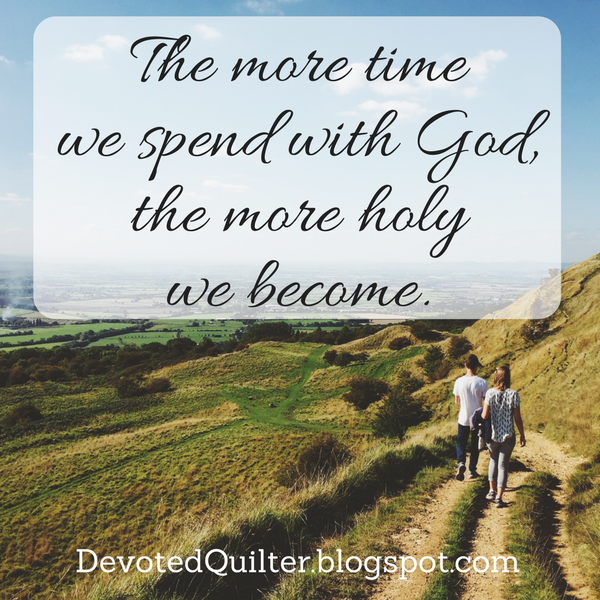 The less time we spend with Him, the harder it will be to be holy. We aren't holy ourselves, but thankfully we can learn how to walk in holiness from God. Leanne, I always enjoy reading your devotionals. They are clear, timely and have a point that I can apply to my life right now. Keep it up.